Ive been meaning to post this and say hello for a few weeks now but middle age , christmas and lots of other excuses have prevented me from doing so , but the time has come! 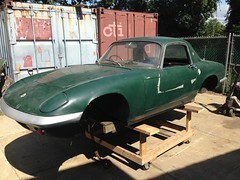 My lotus history such as it is, was that I bought a series 4 elan probably 25 years ago. Being young(ish) and stupid I bought completely the wrong car for me. For a start I like series 3 cars and the car I had bought ( apart from being an s4) had been in a head on accident , the front end had been ripped off completely and the remains had been left outside, uncovered for a number of years. But I trailered the sorry remains home to my parents house and left it on their driveway .Over the next couple of years I spent money on it ,replacing this or repairing that but it was well beyond my abilities and in the end I sold it on and bought my first house. So , 25 years later, round 2 of Lotus ownership. I wasnt actually looking to buy an elan at the time and if I had been it would have been a fully restored '67( year I was born) coupe se.But looking through classic and sportcars ad's last september I spotted a car that had my name written all over it . A 1966 coupe , partially dismantled, missing some big ticket items and sitting in Uxbridge , Massachusetts - perfect , not what I was looking for at all especially since I live in the UK. So of course I bought it . I bought it from Blackstone Motorcars who were brilliant and arranged the transport and shipping back to the UK. Its a right hand drive, according to Andy Graham sold to a Mr. J.Oldham in March 1966 ( 36/5468) , no engine number, body colour, registration number on their files sadly. Somehow it then ended up in the States , possibly since the early '70s and was sold only when the previous owner passed away and his brother sold the car to Blackstone motor cars. Obviously the plan is to restore it fully , will need a new chassis the old one has been repaired and is missing the lower front brace , drivers side door is just a bare shell , wrong steering wheel and a million and one other things but it should keep me occupied for a while! Looks like a nice project. 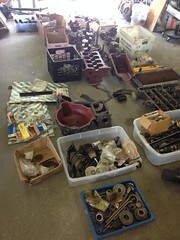 I am restoring 36-5526. My car was always in the south, until I removed it from Little Rock Arkansas in 1978, but at that stage I knew it was not going to see Ohio winters and snow. So, my frame is already cleaned and painted and ready to go. The body is just about ready to leave the paint shop, so things are about ready to start going back together. Welcome to the forum. That’s a great looking project. You must be itching to get stuck into it. Good luck! 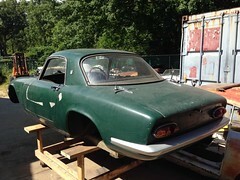 I have an ever so slightly older Coupe which I have been doing a similar project on for much too long now. I seem to have run out of available time to finish it at the moment. I think the pre airflow Coupes were the prettiest of them all but I'm probably a little biased. As your car is close to mine in production, if you have any questions on where stuff goes or "what is this?" then please feel free to ask me or anyone else here....they are a very helpful friendly bunch on the forum. All the best luck and my advice would be to get on with it ASAP and don't get too bogged down in it like I have. Don't underestimate how long it will take as there is a lot to do but keep chipping away at it and it should be a fantastic looking car when finished......they don't drive too badly either! Also, go and visit Susan Miller (Mick Miller Classic Lotus), she is in Saxmundham and what Susan doesn't know about Elans, ain't worth knowing to be honest. Get to know her as she can supply just about all & everything you will need parts wise for your car. She is an absolute pleasure to deal with and will also inspire you with lots of enthusiasm, especially when you are struggling with something along the way. Cannot recommend her enough! All of the other suppliers are brilliant also but you are lucky to have Susan pretty much on your "doorstep"
Will be good to see another 'Pre-Airflow' Coupe on the Suffolk roads sometime in the future. Mine left the Cheshunt factory 15th Feb 1966. Thankyou very much for the kind words of welcome - much appreciated.I will be asking lots of questions , as you can see from the piccies above the previous owner wasn't scared of taking things apart . I wont be doing much to it until summertime , ive got one financial commitment to get out of the way and a house that needs decorating apparently. My biggest worry was the missing drivers side window frame, knowing that these are hard to find but I found one on RD Enterprises web site . I almost fell off my chair when I saw it it , paid for it one Thursday evening and it was with me the following Monday evening - excellent service. 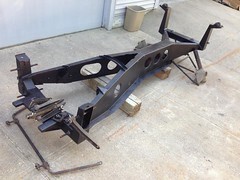 There are currently a pair of window frames for a super safety still listed in the "garage sale" section of Rays website - might be of interest to somebody on here? I think I could visualize your tongue in cheek when you said, "and a house that needs decorating apparently." Good ol' SWMBO Keep us grounded! Good find on the window frame. Take lots of digital photos of every crazy little detail. 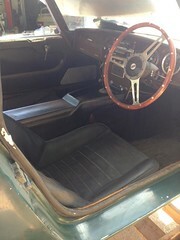 Things like the positions of the coat hook and interior lamps and which of the tach or speedo is on the right or left. Great fun.